Nobody does office desks better than Mayline. With more than 10 collections on the market, finding a Mayline desk for your specific needs is an absolute breeze. Today on 'Desk Showcase' we'll take a look at a few of our favorite workstations from this industry leading brand. Prepare to be impressed! First up, the Medina series MNT40. 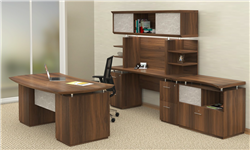 This executive style U shaped desk is available in a choice of 5 designer finish options. If you're tired of traditional tones like cherry and maple, you'll love Medina furniture. Unique tones like Textured Sea Salt and Gray steel have made it a favorite among interior design teams across the country. This popular desk package includes a 63" wide straight front desk, spacious return, matching credenza, and overhead hutch for just $1561.99. 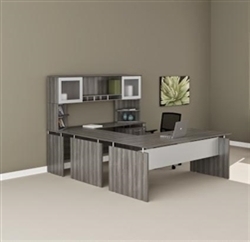 If you can't decide between modern and traditional office furniture for your remodeling project, blend the best of both worlds with the STL10 layout from the Mayline Sterling collection. This 5 piece package offers everything needed to create a fashionable interior that's up to date with today's hottest trends. Going for a unique vibe that's sure to make an impression on your valued office guests? Check out the E5K16 computer furniture set from the Mayline e5 collection. This modular package includes an industrially inspired writing desk that pairs with 2 wall mount hutch units, a cushion top pedestal, and 2 additional low wall storage cabinets. As modern furniture trends come and go, traditionally inspired collections like Sorrento have stood the test of time. This line of luxurious wood veneer desk configurations is truly elite. Sorrento layouts like the ST17 offer unrivaled elegance with 72" wide writing desks and rear wall cabinet configurations designed to enhance appeal and organizing potential. Last but not least, allow us to showcase a desk from one of Mayline's all time best selling lines. The Aberdeen series AT35 desk is an absolute winner. If you're looking to create an elite interior, this top of the line laminate furniture package is a must consider. The AT35 is available in 5 quick shipping finishes, including Mayline's new Gray Steel tone that's been the hottest option on the market in 2017. This 11 piece package is fully loaded with storage cabinets that maximize wall space. The main ARD7236 model office desks boasts a spacious 72"W x 36"D operating surface. 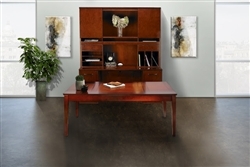 When combined with glass accents and stylish handle pulls, this swanky executive workstation is a true winner.